Birders often seek out rare birds and report these to local email lists, field notes editors, and eBird. But they usually don't report common birds as regularly. As a result we may know more about the status and distribution of rare birds in our region than we do about common birds. eBird has become ubiquitous as the universal tool that birders use to record and share their sightings. This is the ultimate citizen science tool. Using the output tools in eBird one notes that birding hotspots are well covered. Many popular wildlife refuges, local marshes, and estuaries have many observers adding checklists weekly or even daily. But what about birds in our towns and cities? Many eBird users will keep their "yard list" on eBird, but it is hard to determine how far outside their yard they are including, and it is hard to compare with other yards. There are other citizen science projects. Two well known ones are the Christmas Bird Count (CBC) and the Breeding Bird Survey (BBS). These have their important uses, but aren't really suitable for keeping track of common birds throughout the year in towns--where many of a nations' human population live (and where bird populations are thus highly impacted). The CBC is done in December only, covers a rather large area (circle 15 miles across), and has lax protocol that is not repeatable (effort and exact area covered) except as averages over many years.The BBS usually is done in June, has very brief 3-minute point counts, and is a roadside survey with a very strict protocol. These aren't suitable for censusing birds in our cities. Can we use eBird to create a new in-town census that is simple, repeatable, and can tell us about bird population status changes? I believe we can. Start at an intersection of four city blocks and walk around each of the four blocks that meet there. This will likely be less than a mile and will take about 20-30 minutes. Count seen and heard birds on both sides of the streets as far back as the back yards of the houses on the immediate street. Try not to count each bird more than once. Record as a "traveling count" in eBird. Drive around the perimeter of the four blocks and use that as the total mileage (do not count the mileage of the internal streets or alleys you walk). Repeat the count throughout the year, as often as you wish. Map your eBird checklist to the middle of the intersection of the four blocks and don't forget to name your count "4-block census..." in eBird. Count all birds in the area shown on this map. You can adopt a single 4-block area as your local birding patch. It will provide the most data if you count regularly, perhaps weekly, or even daily (dog walk or exercise routine?)! Or perhaps you are only interested in the breeding season or just wintering birds. That's OK, too! 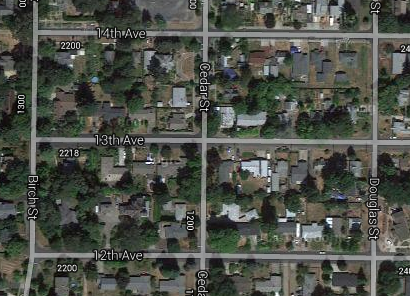 On the other hand, perhaps you'll have several 4-block areas with different landscaping that you wish to compare. It's all possible! Best of all, someone (perhaps even you!) can exactly repeat the count years later to see how bird populations have changed. I can think of several local "town bird" questions such a census might answer right away here in western Oregon. How rare are those winter White-throated Sparrows that show up at feeders in town--maybe more common than we realize? How common in town in summer are some of those birds that we think of as woodland nesters such as Dark-eyed Juncos? How widespread have Eurasian Collared-Doves become? What nearby neighborhoods might have regular Bullock's Orioles or Acorn Woodpeckers or Anna's Hummingbirds or Western Scrub-Jays, or...? What do you think? Does this seem like a reasonable, workable, and fun census? Does something else like this already exist? What "town bird" questions would this census answer in your area? Greg, I think it is a great idea. I always like to count birds in areas that other people don't, including the parking lots of several stores, restaurants, and doctor's offices, etc. I count birds in my yard every day but only count in my neighborhood once in awhile. Have you suggested this protocol to eBird? I know they use to do a "site survey" which I participated in, but I can find no link to it on their new website. It sounds like you are already doing a great job hitting small specific areas with eBird stationary counts. Good job! I can't even remember the last time I saw four square blocks. Well, charcoalhibiscus, you are on your own there! Think of all the wasted fuel from all those lost drivers! Here is an idea: do a point count (eBird stationary count) at the intersection of any place in town you like. Do several throughout the year for 10-15 minutes recording all birds seen and heard. Good reminder not to forget to report common birds - it's so easy not to do. I like your proposal about counting a section regularly. I am going to start doing it on my dog walks. Wonderful! Let me know how it works out for you.